What does Tehran’s focus on building relations with Dushanbe mean for Central Asia? Over the years, many Tajiks have become cognizant that they are increasingly an important piece of the Persian cultural sphere, rather than in the superimposed Russian one that they are so often cast into. Relations between Tajikistan and Iran have seldom received much attention, usually because of the latter’s front-page interactions with the larger, more influential states in the Middle East. Nevertheless, Iran’s relations with the former Soviet republics in Central Asia will be likely to garner significant attention in the coming years, as Tehran seeks to act upon its hegemonic ambitions in the area. For a number of reasons, Iranian aspirations toward Tajikistan have the potential to be more impactful than its relations with other Central Asian states. First, Tajikistan is comparatively the poorest country in Central Asia; it lacks the oil wealth of Kazakhstan or the natural gas of Turkmenistan, leaving it highly susceptible to foreign investment and expertise as it seeks to develop its economy. In the past and present, a host of nations, including Saudi Arabia and Iran, have used economic aid as a means of influencing their political standing in Tajikistan. 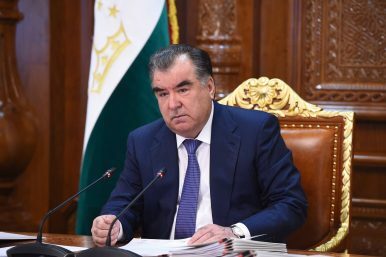 Second, Tajik President Emomali Rahmon may come to consider Tehran a useful counterweight to lingering Russian influence and the preservation of Tajikistan’s heritage and identity. This paranoia was exhibited clearly in Rahmon’s decision to ban giving Russian-style last names to newborns. Iran would do well to exploit this sentiment, and has already taken steps to bolster the resurgence of Persian nationalism in Tajik society. The Tajik language, after all, is a Persian dialect. Iran was among the first countries to open an embassy in Dushanbe in 1992, although its hopes for garnering influence in the newborn state was quickly diminished by the outbreak of the civil war. Iran refrained from officially supporting any side in the conflict, and displayed its neutrality by hosting three peace conferences in 1994, 1995, and 1997. Relations between the two countries were politically sound and economically prosperous during the late 1990s and early 2000s, with bilateral trade between the two growing from $40 million in 2000 to $140 million in 2007, eventually surpassing $200 million in 2011. By the time of the 2005 election of Mahmoud Ahmadinejad, Iran was already one of Tajikistan’s most active and important economic partners. Seeking to add more depth to the existing relationship, Iran actively invested in and a developed a number of industrial projects, most notably a $260 million hydroelectric power plant and the improvement of transport infrastructure. Prior to this development, the largesse required to fund such projects would have limited participation to nations of more considerable means, such as China and Russia. The development of these types of projects greatly enhances Tajikistan’s economy, but also improves Central Asian perceptions of Iran as a regional power. Despite this, Tajikistan’s largest projects still remain firmly in Russian control, as was exhibited when Russia threatened to shut down the second largest hydroelectric dam, nearly triggering an energy crisis. More notably, during a visit to Dushanbe, then-Iranian President Ahmadinejad opened the Iran Culture House, which aims to showcase and export Iranian culture to the Tajik people. This move signaled an obvious intent on the part of Tehran to drum up homegrown support for the Iranian regime, especially as at the time it was undergoing intense diplomatic pressure over its nuclear program. It remains unclear how warmly Rahmon will perceive these types of cultural incursions from Iran. For instance, in 2010, Rahmon personally intervened to prevent a number of students and scholars from traveling to Iran for religious education, citing technicalities as the reason for the cancellation. During this period, however, Rahmon lent his full support for Iran during its tumultuous nuclear negotiations, while simultaneously coordinating common policies with Iran on defense, security issues, and terrorism. Problems arose in late 2015, when it appeared that Rahmon’s loyalties to Tehran might be compromised following a warming in Saudi-Tajik relations. Tehran carefully applied diplomatic pressure on Dushanbe by welcoming Muhiddin Kabiri to Tehran for a political conference. Kabiri was the head of the Islamic Renaissance Party, formerly the largest opposition party in Tajikistan until it was banned and designated a terrorist organization in late 2015. The Iranian state media were quick to publish photos showing a warm greeting between Supreme Leader Ali Khamenei and Kabiri. For Tehran, Kabiri served as an insurance policy of sorts, but also a thinly veiled threat of its willingness disrupt the political status quo in Dushanbe if the Rahmon regime did not expeditiously disengage from serious dialogue with Saudi Arabia. Tajikistan promptly did, likely much to the Saudis’ chagrin. There still remains much room for expansion and growth in the Iran-Tajik relationship. With no outwardly visible signs of improvement in Tajikistan’s economy, Iran’s influence will only be set to increase in the coming years. The influence that Iran will garner will also better position it to apply diplomatic pressure on other Central Asian states. Iran already proved to be a useful, albeit intimidating ally when it intervened in Tajikistan’s favor in a recent Tajik-Uzbek railroad dispute by threatening to stop all Uzbek freight passing through Iran, using the pretense that the aforementioned dispute was interfering in Iran’s economic interests in Tajikistan. It’s no secret that Tehran may well be looking to build for itself what the former U.S. ambassador to Tajikistan calls a “Persian axis” between Iran, Afghanistan, and Tajikistan. This axis also appears to be actively recruiting new members. One prospective member could be Kyrgyzstan, especially with the recent announcement that Iran will develop hydroelectric plants and expand bilateral trade with the small Central Asian state. Only one month ago, Iranian Foreign Minister Mohammad Javad Zarif said there was “no limit to the enhancement of ties with Kyrgyzstan,” perhaps alluding to a potentially enticing foreign aid package that would firmly root Kyrgyzstan in the Iranian sphere of influence. While Iran has likely succeeded in dissuading Rahmon from forming an alliance with Saudi Arabia, Iran still plays second fiddle to Russia when it comes to political influence within the country. Moreover, it appears that there are limitations to the level of cultural exports that the secular Rahmon regime will tolerate from Tehran, which could greatly impede full integration of Tajikistan as an unconditional Iranian ally. Nonetheless, observers would be prudent to keep an eye on relations between these two countries, especially as Iran continues to assert itself in the region. Luciano Arvin is an independent scholar based out of Peterborough, Canada. He primarily covers the foreign relations of Iran, Iraq, and the GCC. Another outgrowth, perhaps, of increased friction between governments in Tehran and Dushanbe.